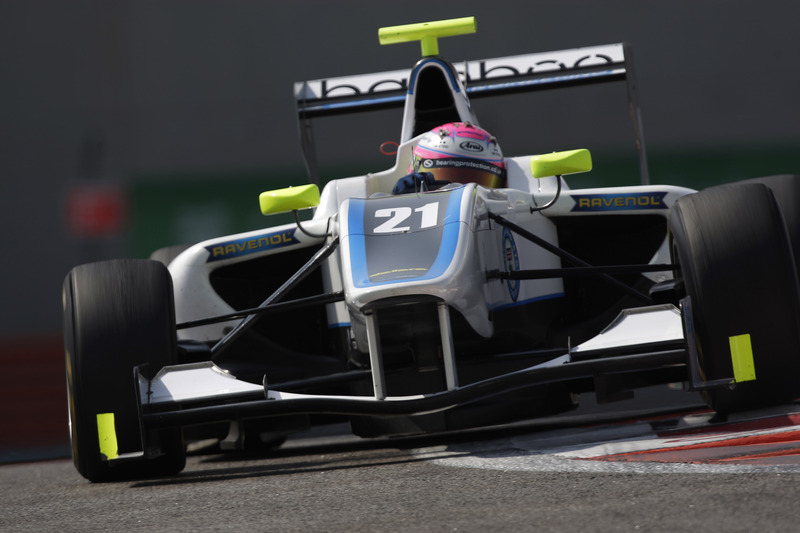 Alice Powell received a late call-up to race for Bamboo Engineering in GP3 this weekend in Abu Dhabi. She joins Carmen Jorda in the team for this one-off appearance. Powell raced in GP3 in 2012, showing impressive pace and maturity and in the process becoming the first woman in GP3 history to score a point. Unfortunately for Powell, she was not able to continue in GP3 in 2013 for financial reasons, and instead went back to Britain to compete in the F3 Cup series, where she finished second in the championship. Considering that Powell was only called about the Abu Dhabi race on Monday of this week, she faces quite an uphill challenge this weekend. She’s never driven the Yas Marina Circuit and has never driven the 2013 GP3 car before. The car is perhaps the greater challenge, as it is significantly quicker than the car used up to the end of 2012. The new car is a naturally-aspirated engine that produces 400bhp, compared to last year’s smaller turbo-charged unit that produced only 280bhp. That’s a massive difference for a car inside the same series and it will take some getting used to. So far this season, the new car has been quicker by a few seconds per lap at every race weekend than last year’s car was in 2012. In terms of learning the circuit, Alice has not had time to make use of a simulator, and has had to learn her way around the track by watching videos of Formula One drivers from the last few years. While that will help with the layout of the track, it’s not a substitute for time on the circuit, which leads to her next challenge – there is only one 45-minute practice session in a GP3 weekend. That practice session has already happened – it took place earlier today. Alice Powell was 21st out of 26 drivers in the session, 3.131 seconds off the pace. It’s no surprise that she was not able to challenge the top half of the field, simply because she’s now had just 45 minutes in the car compared to a whole season for most of the drivers. What was impressive about Alice Powell’s performance in practice in Abu Dhabi was her pace relative to her team-mate. Carmen Jorda has not exactly set the timing screens alight through the season, but she’s had the whole of 2013 to develop and get quicker, while Powell has had no time at all in the GP3 car. Alice was 1.7 seconds quicker than Carmen Jorda despite all the obstacles that she faced, and that is a display of some skill and confidence. The rest of this weekend will be crucial for Alice Powell’s future in single-seater racing. Her stated aim is to race in GP2 or GP3 next season. To achieve that aim, she needs to find a lot of sponsorship by the start of next season. If she can continue to progress through this weekend, and perhaps pick up a point or two in the races, it will be a very strong statement to potential sponsors that she is a worthwhile investment.